Have an idea for an entry? Click here and tell us. CHECK OUT OUR NEW SISTER SITE! Holocaust survivor and professor at Virginia Tech who saved lives while barracading his classroom from shooter. 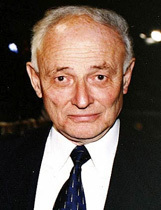 As a young boy in Romania during World War II, after having been shuttled around to various labor and internment camps, Liviu Librescu and his family were confined to a Jewish ghetto in Focsani, Romania. After surviving the war, in the 1960s Librescu studied aeronautical engineering and obtained a Ph.D. at the Institute of Fluid Mechanics, Academy of Science of Romania. After living and teaching for several years as a dissident under the hardships of Nicolae Ceausescu's totalitarian rule--Librescu was forced to smuggle papers out of the country in order to get them published--, in 1978 Librescu and his family immigrated to Israel. There he taught at the Tel-Aviv University for 7 years. Eventually Librescu made his way to the United States to take a teaching position at Virginia Tech, where he remained for the rest of his career and "became one of Virginia Tech�s most respected educators and researchers in the field of aeronautical engineering." Over the course of these years at Virginia Tech he received an enormous amount of awards and honors, and he published extensively. On April 16, 2007, 23-year-old student Cho Seung-hui went on a shooting rampage at Virginia Tech. By the end of the day there were 33 dead and many more wounded in what was considered the "deadliest shooting rampage in American history." While the shooter was trying to make his way into his Norris Hall classroom, Librescu physically barricaded the door so that many of his students could escape through the windows into the bushes. "He did not hesitate to use his body to block the door," said Zeev Bielski, a former mayor of this upper-middle-class suburb of Tel Aviv who now heads the Jewish Agency for Israel. "In that way, he gave life to many." Another said of him, "he is the reason that the student could not get inside and shoot more people," said Asal Arad, a Virginia Tech student. "Obviously, he is a hero." He was ultimately overtaken and killed by the gunman. He was buried in Israel, and is now celebrated in as a hero and example of an "ideal ambassador" for Israelis. At his funeral in Israel, Librescu received the "Grand Cross of Romania, the nation�s highest civilian honor, in honor of [his] 'scientific achievements and heroism.'" Meyer, Daniel. "Liviu Librescu - Virginia Tech Massacre Hero." J-Grit: The Internet Index of Tough Jews. J-Grit.com. Apr. 2019 <http://www.j-grit.com>. Some of these sites were used as source material for this entry and may be of interest to those looking to learn more about this person/topic. Copyright © 2007-2019 J-Grit. All rights reserved.